Before building a way, let us find the main requirements for it. Beginning a new game, or building in-city station, it's often happens a lack of money or a lack of place. In this case building one-line way is a solution. 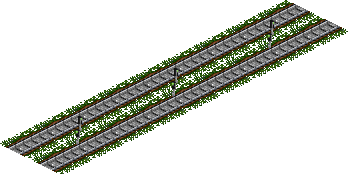 This solution can be used with single train per line or with a group of trains. 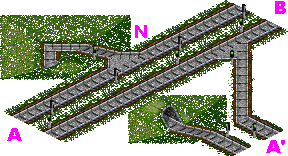 In the second case passing track are used. The station's size and and the way of connecting a station to the way depend on available place and money. 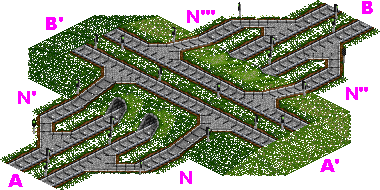 It consists of a station (A and B), a depot before and after (usually the same depot) the station (E and F) and a way to it (C). Schemas 1.1, 1.2 and 1.3 show some possible variants. The number of passing tracks depends on the number of trains, but it's better to have more of them, than number of trains mines one. The distance between passing tracks has to be not too large to prevent long train's waiting. 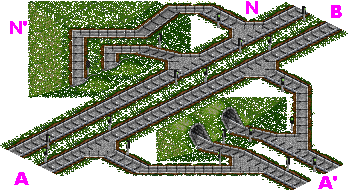 It's better not to build passing tracks fuhrer than 30 squares. 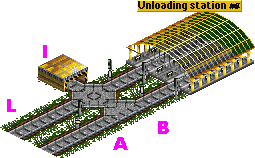 When the way is ended with unloading stations on the one side and loading station on the other, the priority for trains coming from loading stations can be simply achieved using schema 11.4. In case of equal stations (for example passengers traffic between two cities), schema 11.5 is better. Represented solutions (11.4 and 11.5) are incompatible and can't alternate. 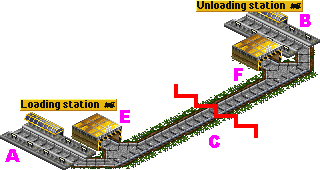 In case of using schema 11.4, exit signals on the loading station in-line block are required, as at unloading station represented on schema 1.7. When the number of trains increases, it's required to increase the way's capacity. In this case, two one-line ways are used. One for one direction and one for the other as it represented on schema 1.6. Stations can be connected to two one-line ways with united station's enter and exit (schema 11.7) or separated (Ro-Ro station). 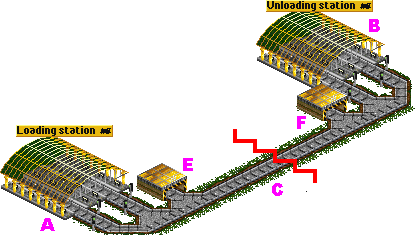 Known problem: when a trains comes in depot I and all the platforms become busy, a train can go to way from the station L and be lost. Two one-line ways with fixed directions is also a way. Such ways can be connected to each other. First case - ways merging, represented at schema 11.8. In this case B direction is accessible from both A and A' directions. But direction A is not accessible from direction A' and vice versa. To connect directions All to All something like schema 11.9 is required (second case). But this solution has a little imperfection - trains from B to A' and from A' to A impede each other (The exit from block N is before the enter of block N'). Solution at schema 11.10 doesn't have such a imperfection. This trains don't impede each other, because the exit from block N is after the enter of block N'. Third case is intersection of the ways. Cloverleaf - the standard solution for intersections. Simplified version of the cloverleaf is represented at schema 11.11. The imperfection of the schema is that train has to make three loops before turning right. For example, to go to A' from A it has to pass N', N'' and N''' blocks. 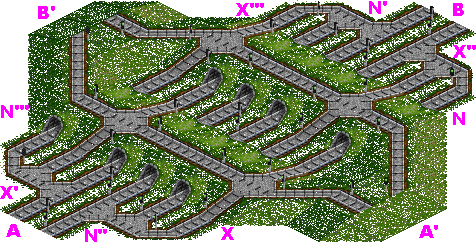 Standard version of cloverleaf (schema 11.12) has additional blocks X, X', X'' and X''' for turning right. But both types of cloverleaf are liable to appearing of traffic jams. to prevent appearing of traffic jams, schema 11.13 should be used instead. This schema differs from cloverleaf schemas (11.11 and 11.12) in one fundamental moment - it has no self-connected points. 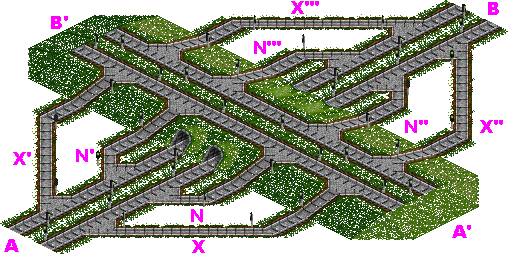 In case of cloverleaf any point in blocks group N, N', N'' and N''' is connected to itself via this group of blocks. This is the origin of traffic jams. Schema 11.13 has no self-connected points and not affected by traffic jams.